I grew up among the Greatest Generation of video gamers – those who spent their time in the trenches waging war with antiquated technology like the Atari 2600 – fighting the good fight while trying to peer through the fog of war (represented by a monochromatic mass of pixels) in hopes that something beautiful rested on the other side. When the Nintendo Entertainment System resurrected gaming as a hobby and later, a mainstream entertainment choice, we knew our grunt work would pay off. The NES gave birth to Super Mario Brothers, the great 2D adventure that arguably fathered the billion dollar gaming industry we revel in today. And while we live the good life now, with Wi-Fi enabled super consoles linking battalions of virtual soldiers and adventurers across the globe, those who stayed on this meandering path through the decades, funding each new console generation with enough hard-earned dollars to guarantee additional R&D resources for each successive system, will sometimes cast a wandering eye back in time – and shed a tear for those great games that first planted these seeds of hope within us. And it’s this nostalgia, coupled with the fact that we’ve grown up and can afford all the hot new toys, that convinces game companies to toss us a bone every now and again – ripping an artifact from the past and applying a glossy new coat of paint. It’s this knowledge of nostalgia and its effects on our heavy hearts and weak wallets that led to the latest release from Nintendo, Wario Land: Shake It. 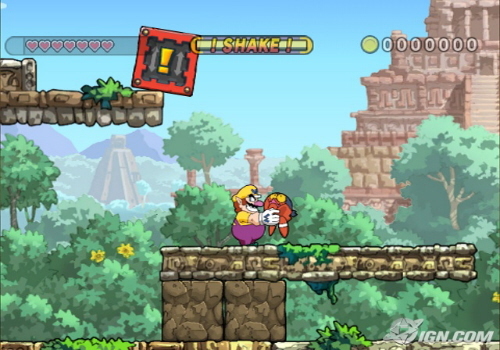 Wario Land: Shake It is a loving tribute to the classic 2D platform adventures that Nintendo once fine-tuned and dropped on hungry gamers once a year. Nintendo cut their chops on the original NES and really perfected the art of electronic entertainment with finely crafted adventures that showcased the upper limits of their bit potential – be it 8, 16 or beyond. Nintendo may not have invented gaming but through their nurturing of the Mario, Metroid and Zelda series, they certainly perfected it. And while they’ve begun to conquer brave new worlds in a bid to bring more gamers into the fold through easy ‘pick-up-and-play’ game concepts and controls, the company remains mindful of its past. With the release of Wario Land: Shake It, they do a nice job of merging their two top paradigms – combining a focus on quality game design with new accommodations for the casual gamer. Wario Land: Shake It hits shelves in the middle of a mini-renaissance for the class 2D game design. In recent months, titles like Bionic Commando: Re-Armed, Mega Man 9 and Braid have seen great dividends despite the loss of one dimension. While all of these games burst from common ground and shared history, the biggest unifying factor pointing towards their wild success is that they employ spectacular art design. Simply put, great art never goes bad. A maxim that properly defines Wario Land, a title that strikes gamers with hand-drawn art and animation seemingly ripped from the silver screen. While gamers may look to Wario and spy the prettiest Mario game they’ve ever seen, the Wario Land series actually twists the conventions made famous by his goody-two-shoes doppelganger. Where Mario is always seeking out his lost Princess, Wario is after nothing but “fortune and glory.” That has been Wario’s stock in trade through his previous console and Gameboy iterations and despite the shiny new surroundings where he finds himself cast as a reluctant hero, he is ultimately looking to pad his coffers with more loot. Sure, the game features a throwaway story line where Wario is summoned to a fantasy land to liberate the enslaved inhabitants but that’s really just a plot hook to set him loose chasing the money. Wario Land employs traditional platform game design with the now customary overworlds and hubs dispensed in favor of a simple map screen. As players work through levels, the goal is to accumulate enough coins to buy additional maps that unlock subsequent levels. Cash can be found through successfully locating the 3 hidden treasures on each level as well as exploiting a number of opportunities for liberating the generous amount of loot dotting each level. Treasure chests will kick out plenty of coins and Wario will quickly learn that in addition to defeating enemies, he can stun them, grab them, and then with a rhythmic wave of the Wiimote, shake them down for their loose picket change – a humorous sequence that never seems to get old. While the various levels can be run through rather quickly (10 – 15 minutes will usually get you to the end), the game is designed to encourage exploration through a series of sub-quests assigned at the start of each level. In addition to satisfying the narrative requirements (i.e. journey through the pirate ship to locate the captain), the game will also flash a series of extra missions that if completed will result in more coins and unlockable bonuses. These extra objectives could range from collecting a certain amount of cash or completing the level in a certain amount of time to more obscure challenges like bouncing off three enemies heads without hitting the ground, among others. Often times, these extra objectives will require players to run through the level multiple times to completely satisfy their requirements. In addition, as typical of Nintendo’s design philosophy, the game encourages and rewards thorough exploration of the massive environments, as a number of secret items, treasures and the keys to completing the bonus objectives will often be found in hard to reach places through skillful use of Wario’s abilities. At the outset of the game, players are given control over Wario as he journeys through a massive pirate ship. This introductory level acts as the tutorial. While the control scheme reflects the old school design philosophies governing the title (with the controller held sideways like an old NES controller and only two buttons employed for Wario’s actions), there are a series of context sensitive waggle controls introduced through this initial stage that do a nice job of marrying the old with the new. While the two primary controller buttons handle Wario’s basic attacks and jumps, players quickly find that they can execute a powerful Ground Stomp by raising the controller and swiftly bringing it down. This can be used for offensive attacks as well as to solve puzzles and bash through brittle sections of the environment. Wario is also able to initiate a speed-dash that will cause him to tear through enemies, obstacles and traverse the typical end-of-level race against time event. The game also utilizes the IR-pointer aspect of the Wiimote, allowing players to call their shots when tossing an enemy or item. Once again, this functionality is usually integrated with the various puzzles that crop up through the levels – with the player often charged with hunting down an out-of-the-way switch and then firing away at it to gain further access to the current level. While Wario will traverse a number of cliché game environments (yes – there are both fire and ice worlds), the backdrops showcase breathtaking artwork. Wario and the assorted characters look and move like animated characters – the effect is even more striking than the cel-shading Nintendo employed in The Legend of Zelda – The Wind Waker. These are true living, breathing cartoons. Finally, Wario Land grabs the baton ferried by the classics of the form and introduces a stable set of world class boss battles. Each boss is different and call upon the player to utilize their learned abilities to take them down. It’s a page ripped right from the Nintendo playbook and players who have grown up studying that hallowed text know to examine their environments and every inch of their nemesis to find the key which unlocks their defeat. Epic boss battles are a staple of 2D platformers and Wario Land effortlessly picks up the mantle. Whether you grew up subsisting on a staple of these games or entered the fray later and want to know what all the fuss was about, it’s time we work through the ratings and see if Wario Land – Shake It kicks it old school. Great art will never age. I’m a huge fan of hand drawn animation, an aesthetic that Wario Land wears very well, and the design decision to eschew pumping more polygons in favor of good-old fashioned sprites brings this title up several notches in my book. While we may look back at some traditional 2D platformers from the past and wonder how our eyes were ever deceived, the fact that Wario is launching now – in the midst of the HD era – proves that this game will look good 20 years from now. From the vivid hand-painted backdrops to the fluid animation that brings even the most minor villains to life, Wario Land is a Crayola-hued confection that’s worth posting on your fridge. Two decades in the future, we’ll look at Gears of War 2 like we look at Yar’s Revenge now, but Wario Land will remain a title to behold. What I wouldn’t give to see Mario or Metroid given the same treatment. Having grown up an inaugural member of the Nintendo Generation, I am a sucker for their game-changing design choices. Nintendo was the trend leader for a long time and they pioneered many of the gameplay concepts in play today. Their approach to action-adventure game design prompts a Pavlovian response in me – something that the Wario team embraces. Simply put, this game rewards enhanced exploration of the massive levels. While finding your way from the beginning to the End Boss is fairly obvious, the real fun is found in exploring all of the nooks and crannies jammed throughout each massive level. The game soars when the player spots treasure in a hard-to-reach location and then begins the process of scouring the level to ascertain the right abilities and environmental objects required to liberate the prize. 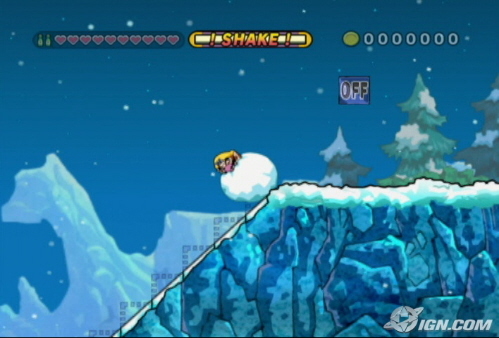 In addition to the addictive run and jump mechanics employed throughout the game, the developers mix things up through an escalating series of creative departures – placing Wario in control of a unicycle, submarine and other vehicles at various points. The optional challenges can lend a puzzle element to the proceedings with players working to determine the best route to follow in order to finish a level in record time. While playing through the same level multiple times can grow repetitive, the environments are so vibrant that most players won’t mind revisiting these beautiful vistas. I’m a big fan of the Wii and its potential but the one criticism I have lobbed time and again is the unnecessary application of ‘waggle’ controls. Some games feel they have to shoehorn these gimmicky controls as if a Wii game without them would nullify its existence. Wario Land may employ a number of motion-sensitive actions but none of them border on the outlandish. While the Ground Pound maneuver does begin to wear out its welcome (I found my wrist aching after a few marathon sessions) some of the other, optional movements are pretty satisfying. I particularly enjoyed grabbing a stunned enemy and waving the Wiimote back and forth as Wario grabbed the offending party and shook them down for extra scratch. Aside from that, the controls are as simplistic and elegant as anything from the 8-bit era with the game controlled using the Wiimote in the classic NES horizontal position. The controls also feel very tight, allowing players to guide Wario to pixel perfect landings, something that could not always be said for his forbearers. Here’s one area where Wario suffers in comparison to his ancestors. None of the themes carried the same infectious melodies that implanted ‘The Underworld Theme’ as a permanent fixture in my neural archives. Most of the music heard in the game is serviceable background noise. The tunes back up the onscreen action but do nothing to give it much life. Wario Land is cut from the same cloth as other classic platformers, meaning the enemies all follow their own set routines. That’s par for the course for this genre as the trick is often identifying and memorizing patterns to get through trickier areas versus changing up your strategy to deal with complex adaptive AI schemes. That’s just not a big component of this genre. Wario Land is an old school throwback and the enemy intelligence is right in step with that, adhering to their prime directive – ‘Walk Right. Walk Left. If Wario gets in your way – Hurt Him.’ As with most platformers, the intelligence demands fall squarely on the player. Wario Land is not a particularly difficult game, especially if your objective is to race through each level as fast as possible. The enemy foot soldiers are easily surmounted and the various puzzles that pop us can usually be solved with a few moments of contemplative thought as each usually involves one of Wario’s trademark moves in conjunction with an environmental object. There are a few trickier areas but long-time Nintendo platform and adventure fans should find them easily overcome assuming you know to look around. The boss battles do provide a slight increase in challenge. More importantly, each one is unique and memorable. Great boss fights have become something of a lost art so it’s nice to see the Wario developers resurrect this staple. For those players who approach Wario Land from a completionist standpoint and are aiming for the 100% Save File, the additional Bonus Challenges that require players to revisit levels and fully explore them in order to meet certain conditions increase the difficulty exponentially – with some of the mad dash races through a level while avoiding enemy encounters proving especially taxing. 2008 may go down in history as the year of the platformer or at the very least, as the year that platformers refused to go quietly into the night. Braid, Mega Man 9, Bionic Commando: Rearmed, and LittleBigPlanet are just a sampling from this banquet. Wario Land: Shake It arrives as a welcome guest – paying homage to past Nintendo classics, showcasing Wario’s unique brand of platforming (and attitude) and through exceptional art design, showcasing a vibrant, inviting adventure. Wario may not sit tall among Nintendo’s Holy Trinity of Mario, Metroid and Zelda but seeing the exceptional care and craftsmanship employed to make his new adventure shine, makes one yearn for similar treatment for those stalwart heroes. They deserve it and so do we. Old school platform adventure gamers are urged to tickle that nostalgia bone and pick this one up. The rest of you whippersnappers need a history lesson. Pick up Wario and unlock the secrets to how we got sucked into this glorious pastime in the first place. Wow… I was just really confused for a few seconds. I thought this game wasn’t coming out till April ’09. Where have I been? I didn’t even know of this game’s existence until I saw a preview of it playing at my local Toys “R” Us. I’ve always loved the Wario games, I’ve been playing them since the original Wario Land for Game Boy. I’m definitely going to give this one a go! @prkttear: Looks like Christmas just came early to you this year – or late, as it were. : ) Either way, I think you’ll really dig this game.